Qedit for Windows 5.5 offers the following enhancements. Documents displayed with syntax colors can now be printed with the same colors. 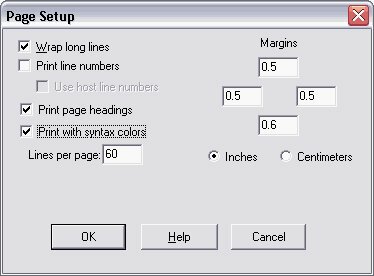 If you intend to use this feature, you should select a color scheme that will work well on the screen as on paper. For example, a color scheme with light colors on a dark background works well on a monitor. However, the same light colors on a white background such as a piece of paper might not be readable. To mitigate this a bit, Qedit automatically replaces white with black on the printout. Color printing only works on local printers. The feature is disabled by default and can be enabled on the Page Setup dialog box. The Restore option brings the backup back and Qedit tries to load it. If this also fails, Qedit simply erases the document database. 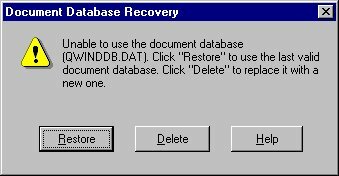 The Delete option erases the current document database and starts with an empty one. Keep in mind that erasing the document database removes things like the recent files list and any Favorites. When connected to a server version 5.4.10 or higher, Qedit for Windows displays a warning message when the server runs out of line numbers while opening a numbered file. A rectangular selection does not go past the rightmost column of the file. For a Cobx file, the selection does not go into the tag area. Copy/Cut of a rectangular selection does not copy the Cobx tag anymore. The server and client views of a file were sometimes different after pasting some lines in a Cobol source file. The problem could lead to file corruption, strange behavior and even client aborts. A number of Qedit for Windows aborts with a linecount discrepancy error (mostly after a Paste or Undo) have been fixed. Copy or Cut operations sometimes caused server errors 22 or 71. These problems occurred when the end of the rectangle (mouse pointer) was outside the Qedit for Windows window, in the undefined area past the rightmost column of the file or when the start/end corner of the rectangle was the top-right corner.